Excitement over the new Sunpreme raisins was evident at UC Kearney Grape Day Aug. 8, 2017. As soon as the tram stopped, dozens of farmers and other industry professionals rushed over to the vineyard to take a close look and sample the fruit. Raisins pulled from the vine were meaty with very little residual seed. The flavor was a deep, sweet floral with a muscat note. 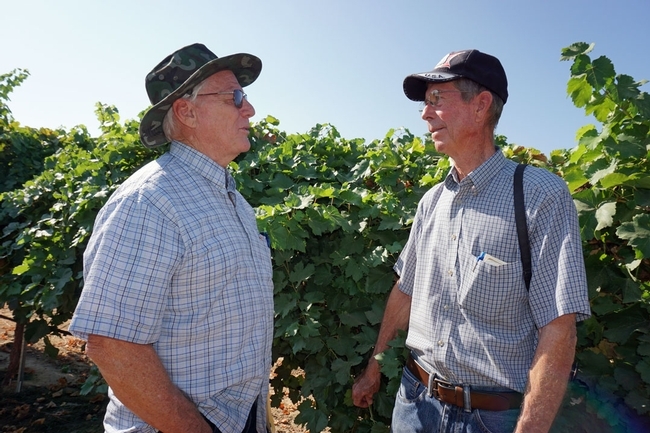 Sunpreme raisins, bred by now-retired USDA breeder David Ramming, promise a nearly labor-free raisin production system. Traditionally, raisins are picked and placed on paper trays on the vineyard floor to dry. The development of dried-on-the-vine varieties opened the door to greater mechanization. Workers would cut the stems above clusters of grapes, which then dry out in the canopy and are harvested mechanically. The new wrinkle with Sunpreme is that grapes ripen and then start to dry on their own - no cane cutting needed. Sunpreme raisins drying on their own in a Kearney vineyard. 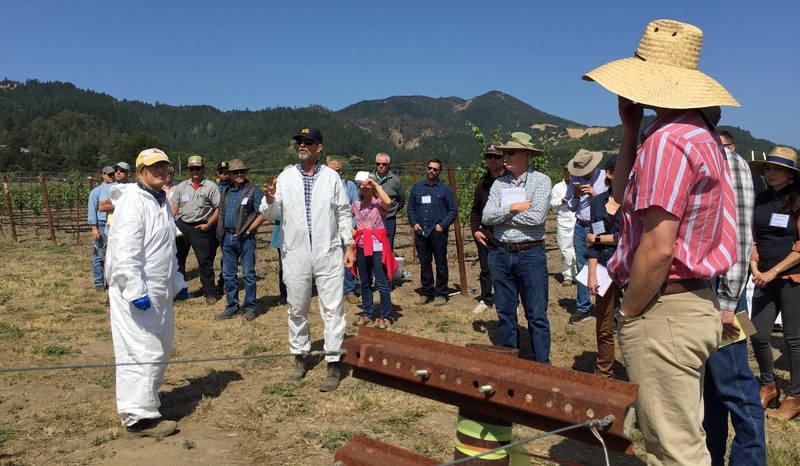 UC Cooperative Extension viticulture specialist Matthew Fidelibus and UCCE viticulture advisor George Zhuang are now studying the performance of Sunpreme grapes on different rootstocks and trellis systems at the UC Kearney Agricultural Research and Extension Center. 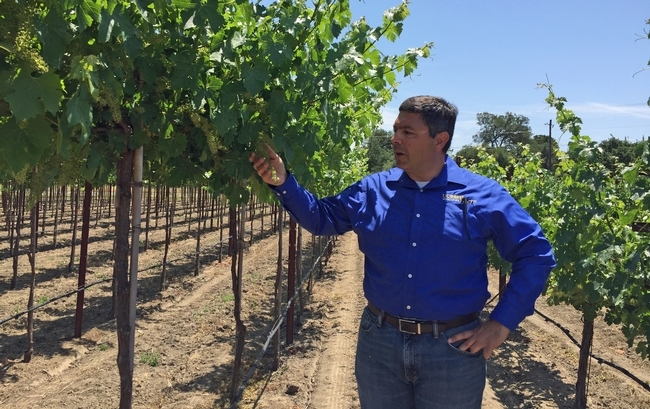 "We didn't know a lot about this variety," Fidelibus said. "We've found it to be very vigorous." 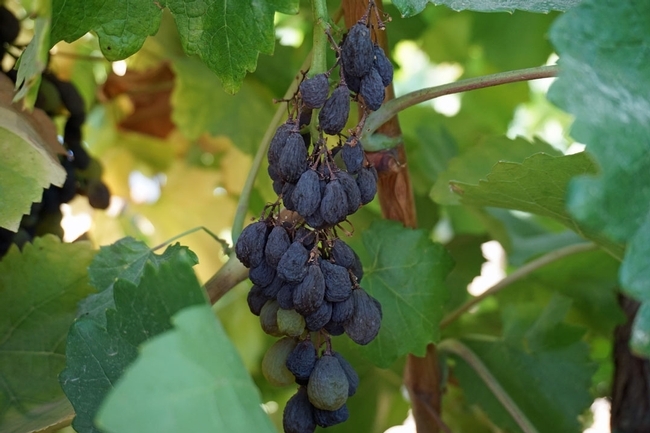 Fidelibus said the raisins take about a month to dry, and one challenge is the tendency for dried raisins to drop off the vine. "We want to keep the self drying and stop self dropping," he said. 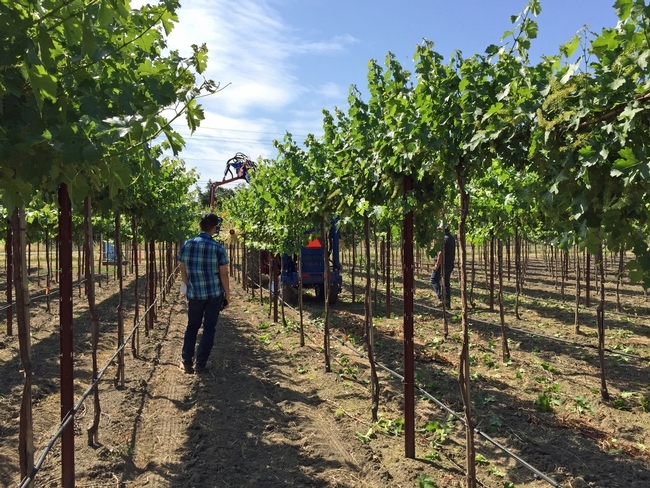 UCCE specialist Matt Fidelibus is conducting rootstock and trellis system experiments on Sunpreme raisins. Ramming discovered the Sunpreme variety in a Thompson seedless table grape variety trial in the mid-1990s. He was going down the row, saw clusters of raisins and screeched to a stop. He had discovered Sunpreme. 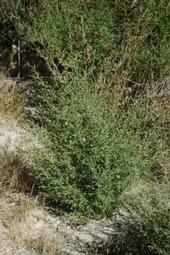 The variety is not yet available for commercial production. UCCE viticulture advisor emeritus George Levitt, left, chats with retired USDA breeder David Ramming at Grape Day 2017. 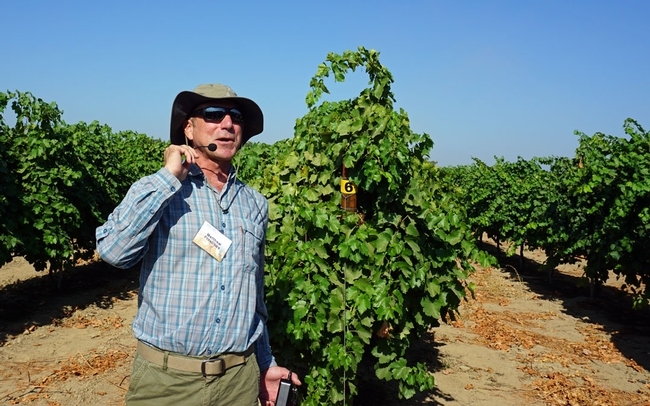 UCCE nematology specialist Andreas Westphal in front of a Sauvignon Blanc vineyard where nematode treatments are under study. 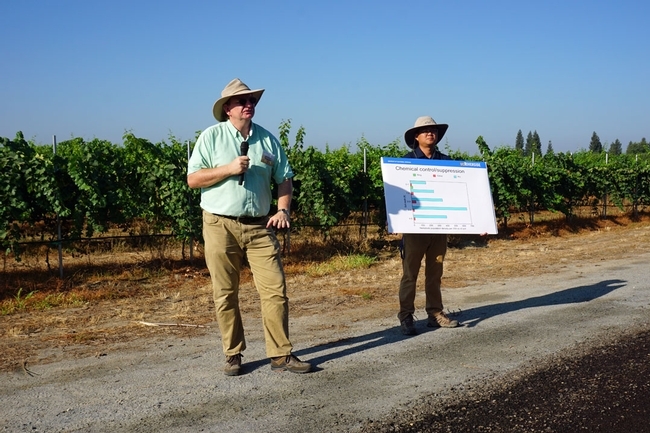 UCCE farm advisor George Zhuang is holding the chart. Also during Grape Day 2017, UC Cooperative Extension nemotology specialist Andreas Westphal outlined research underway to keep nematodes at bay. 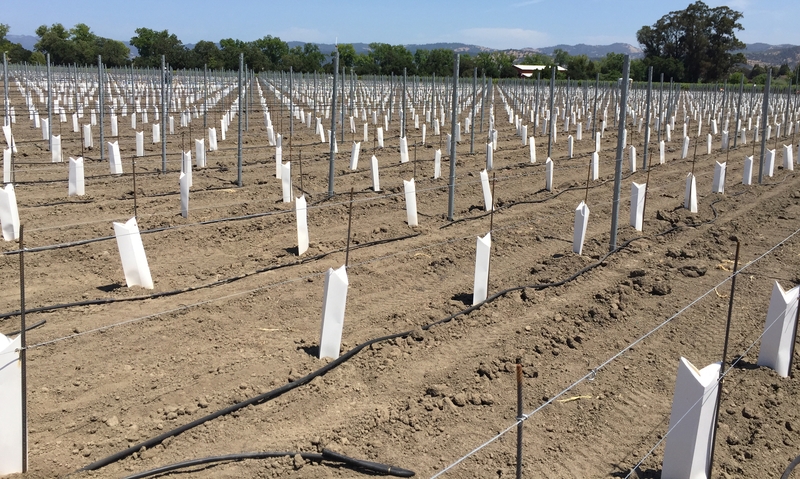 "There's no methyl bromide in commercial planting," Westphal said. The very effective fumigant was banned because of it's tendency to deplete ozone in the atmosphere and the risk to human health because of its toxicity. Many farmers have turned to Telone as an alternative, however it is expensive and its use is limited by a township cap. 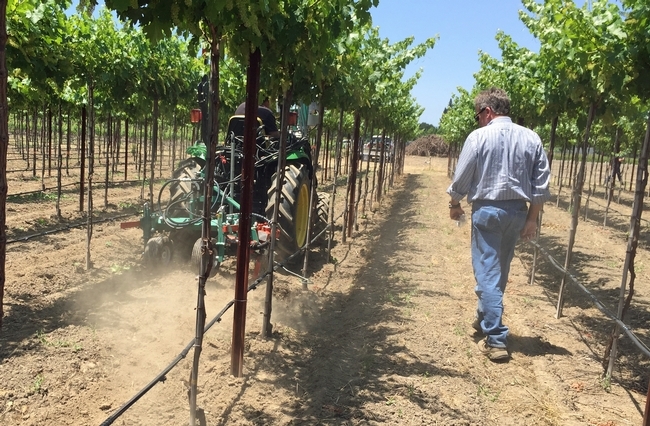 Westphal is comparing alternative treatments for clearing the soil of the tiny worms that feed on vine roots and inhibit vineyard productivity. "Some companies are coming up with new chemistry," Westphal said. "Our challenge in the perennial world is that the roots go so deep." 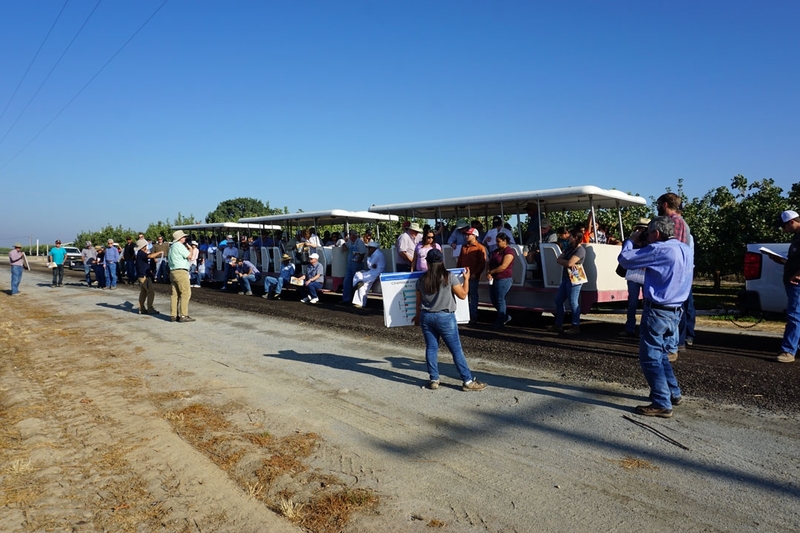 UCCE specialist Andrea Westphal addresses the crowd. Seven new products and Telon were drenched in different replicated research plots. Some areas were left alone to serve as control. Three times the number of Sauvignon Blanc vines were planted in the plots compared to a typical vineyard so researchers could take out plants twice and examine the roots for evidence of pests. "We are excited to see significant growth differences among the treatments," Westphal said, pointing out a row that was visibly shorter and less vigorous. "It amazed me. Three years after treatment, and it never grew back out of it." Work is still ongoing, but Westphal said he believes some chemical treatment could be available in the future to help reduce nematode pressure. 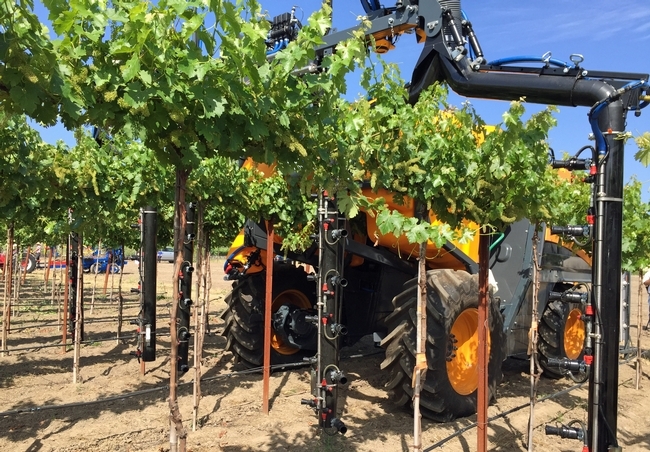 To deal with nematode populations, Westphal encouraged growers to sample soil and communicate with the diagnostic laboratory to determine what pest nematodes are in their vineyards, and then use that information for root stock selection. "Growers should not forget the value of nematode-resistant rootstocks," he said. "Plant material needs to be chosen very carefully when different species of nematodes are present." A colleague shared the following with me (thanks Sue!) 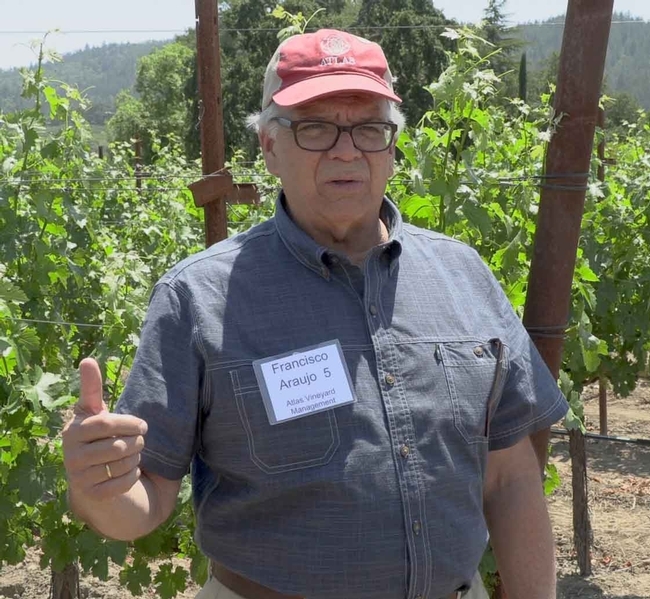 During the 2015 Sonoma Grape Expo, John Roncoroni addresses Weed Control in the North Coast.